If you have dry, chemically treated, permed, or unruly hair, the best honey masks for hair can get your hair back to its healthiest state in just a few minutes! Honey is known for being great for hair: it can repair damaged hair follicles, reduce splitting and breaking, and help treat your irritated scalp! To help you find the right honey hair mask for your hair, here are a few things to think about before we get into our reviews! Organic: While honey is an organic ingredient, we also tell you if the other ingredients in each mask are organic too. If you prefer to use all organic ingredients in your beauty routine, there are several masks here that will work! Package Size: To help you find a honey hair mask that will fit your budget, we’ll let you know how many ounces each package contains. This is especially important if you have long, thick hair, which may require a lot of product! Pieces: Some of the products we reviewed give you the option of ordering multiple containers in one order. We’ll let you know if the price is for one or more containers, so you can stock up on only what you need! Paraben-Free: Parabens are preservatives commonly found in beauty products. Many are concerned they may cause hormone problems or cancer if used regularly. If you prefer to avoid parabens in your beauty routine, we found several masks you can feel safe using! Additional Ingredient: In addition to honey, each mask we reviewed uses other natural ingredients that provide extra benefits for your hair. They may include things like olive oil, avocado, and even eggs to provide extra strength, shine, and manageability to your hair. Type: All of the masks we reviewed are rinse-out treatments that you use with or after your regular conditioner, then rinse clean. We’ll let you know if any of them can also double as a leave-in treatment for extra dry hair. Now that you know what to look for, let’s get into the reviews! We researched several hair masks that use honey as their main ingredient and found 10 that truly stood out. These masks work with a variety of hair textures, and we found them at every price point so you can get great hair at any budget! If you’re short on time, that’s fine! Check out the Top Pick and Budget Pick, and then come back to read more! Our Top Pick for the best honey mask is this luxurious and fast-acting mask from Mon Platin. It’s a great mask to use if your hair is color treated, permed, bleached, or overly dry. In addition to honey, it also has olive oil, royal jelly, and other luscious ingredients to help nourish and smooth even the coarsest hair. There are also amino acids that help keep your scalp clean and healthy, which encourages healthy hair growth. It’s also incredibly easy to use! Just work it into clean and dry hair, wrap in a towel, and wait 5 minutes before rinsing out! No need to leave it in for hours or overnight! For chemically treated hair, you only need to do it twice a week for the first couple months, then just do it whenever your hair needs a touch-up! We also like that this comes in a 17 oz. container, giving you plenty to do several treatments before repurchasing! 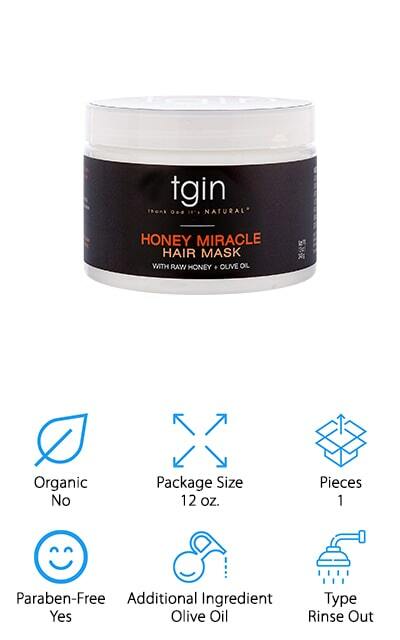 For beauty gurus on a budget, this hair mask from tgin is a great way to get smooth, shiny hair without the luxury price tag! 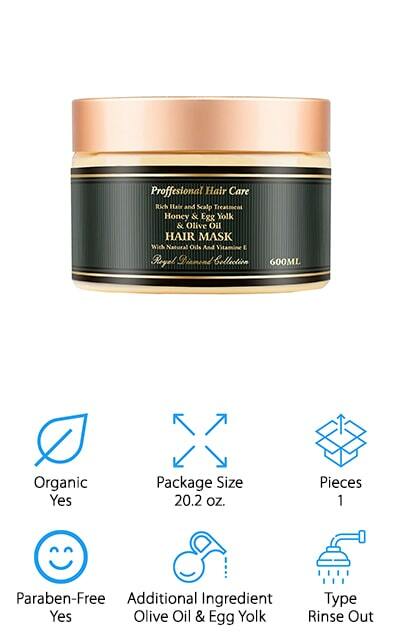 This mask uses raw honey, olive oil, and jojoba oil to moisturize your hair from scalp to ends. It also has vitamins A, D, and E to help repair damage from dryness, chemicals, or using too much heat. We like that this honey mask for hair also works well to keep your scalp healthy by adding moisture without irritation. A healthy scalp means healthier hair growth! It’s also really easy to use! Just wash and condition your hair like you usually do, then add the mask from root to tip. Then, all you have to do is wrap, sit under a dryer for 10-15 minutes (or without heat for 35 minutes to 1 hour), and then rinse it out! This is a great mask to use while watching TV or doing other home spa treatments! 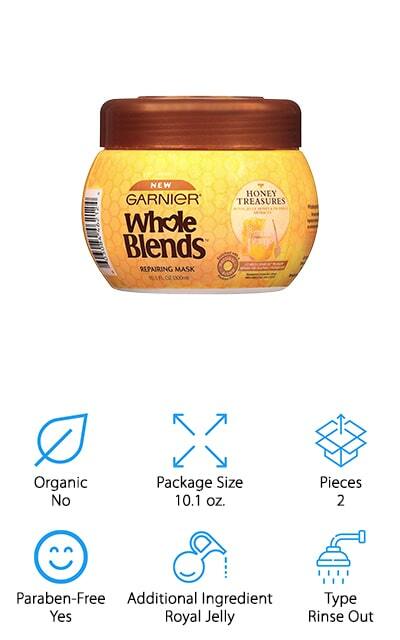 Another great honey hair mask for dry hair is this budget-friendly hair mask from Garnier! If you’re looking to stock up on hair masks, or you have long hair, this comes in a pack of 2 so you won’t run out any time soon! 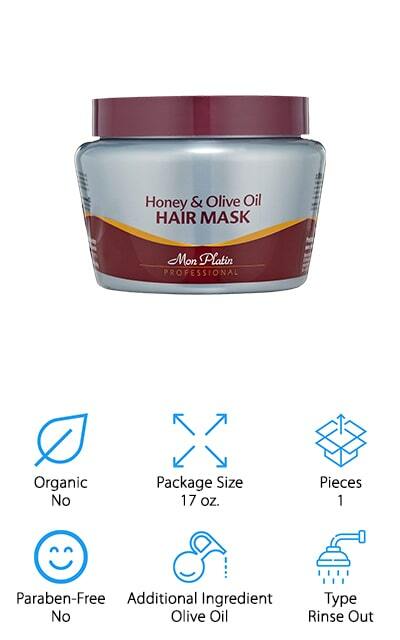 The mask uses honey, royal jelly, and propolis to nourish your hair and soothe any scalp irritation from dryness, chemicals, tight braids, etc. This is great to use with any texture of hair – even fine hair – to moisturize and prevent split ends. It’s especially great for color-treated and chemically treated hair since it won’t cause brassiness or other changes in your hair color. We also like that you can use this while in the shower – just put it on after shampooing, leave it to sit for 3 minutes while you enjoy your hot shower, and rinse! Garnier also has a matching shampoo and conditioner you can use with this mask for even more moisturizing and healing power! 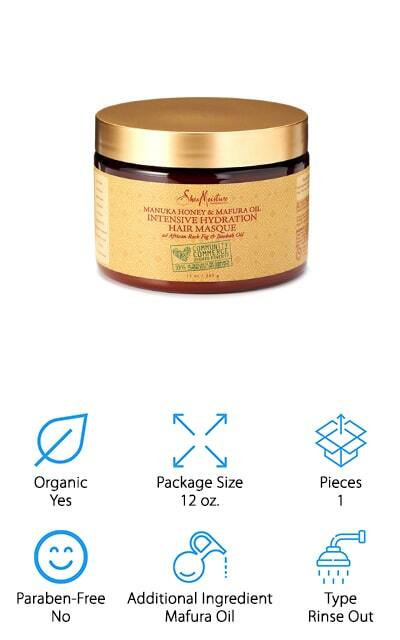 If you’re looking for a manuka honey hair mask, this one from SheaMoisture will make a great addition to your hair care routine! SheaMoisture is well known for making all natural, organic, and highly effective hair products for women with dry, curly, and hard to manage hair. This mask uses mauka honey and mafura oil to moisturize and treat dry hair, making it smooth and manageable. It also uses baobab, raw shea butter, and other essential oils to keep hair frizz-free and shiny all day. You can add this to your hair in the shower after shampooing, then rinse after 5 minutes. Or, for extra dry or frizzy hair, leave it on longer – even overnight – for maximum effects! We like that SheaMoisture also sells a shampoo and conditioner with manuka honey and mafura oil to use every day for shiny, beautiful hair! This is a great line of products to use if you’re just starting your journey to natural hair! Finding the best hair treatments to use while you are pregnant or breastfeeding can be daunting – you have to be extra careful to avoid harmful chemicals that could affect you and your new baby. No worries – we found the answer! Thankfully, this hair mask from Aroma Dead Sea is perfectly safe for pregnant and breastfeeding moms to use! We like that it uses organic, all-natural ingredients to nourish and protect your hair, which can become drier and more brittle during or after pregnancy. 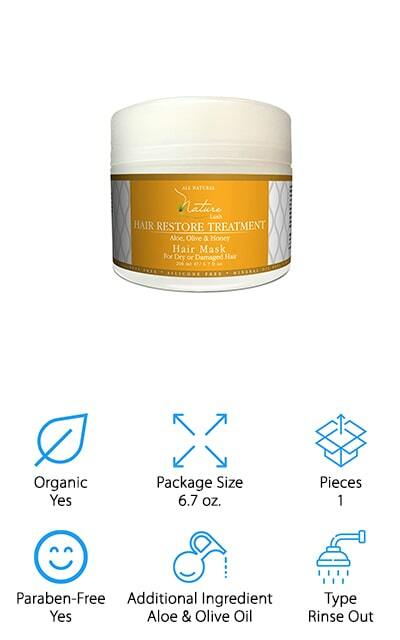 This mask uses egg yolk, honey, and propolis to moisturize hair and promote healthy growth. It also uses olive oil and plant-derived glycerin to soothe your irritated scalp and add shine. True to its name, this mask also has Dead Sea salt and minerals to help nourish and strengthen your scalp and hair! It’s also easy to use and works in just 5 minutes, so you can get back to spending time with your precious little ones! Avocado isn’t only great on your slathering on your morning toast or in your favorite guacamole – it also makes for a great hair conditioning treatment! 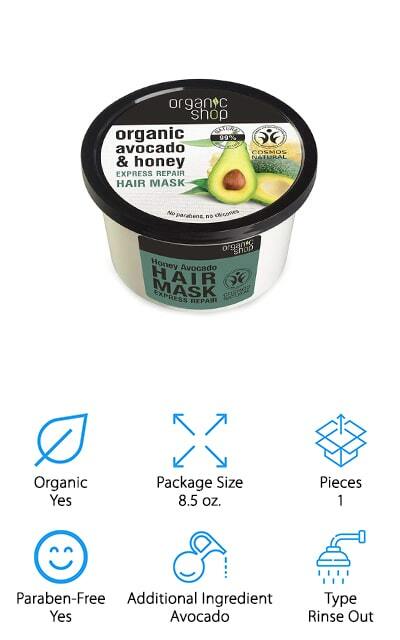 This hair mask from Organic Shop uses avocado oil and honey to moisturize and repair damaged hair. It’s silicone and paraben free, and 99% of its ingredients are certified natural or derived from natural sources like plants, seeds, minerals, and oils. Organic honey helps to repair damaged hair, soothe scalp irritation, and promote healthy hair growth. The avocado oil adds shine and softness without weighing down your hair. You can have soft, bouncy hair – even on days when you use a serious moisturizing treatment! We like that this mask uses natural ingredients that are good for all types of hair, from curly to fine, color treated and all natural hair! We think this is a great mask if you’re looking for a gentle, yet effective conditioning treatment to restore your hair to looking its best! Hair loss is something that no woman likes to think about, but it does happen due to stress, aging, medications, illness, and even pregnancy. Finding the best honey for hair that can also help treat hair loss can be a major relief – and we found one we think you should try! 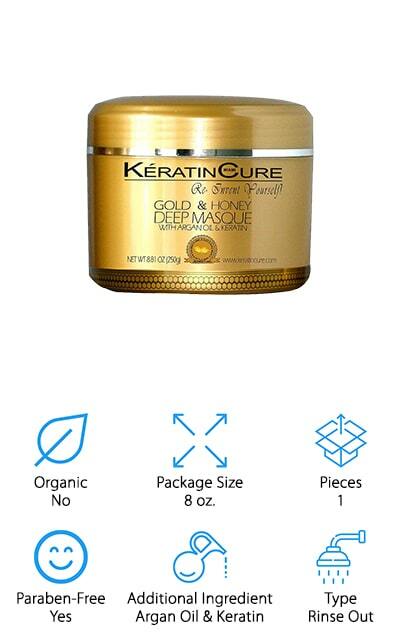 This hair mask from Keratin Cure uses honey and other natural ingredients to nourish hair while also promoting healthy hair growth. To add moisture and shine, honey, argan oil, and shea butter keep hair follicles soft, supple, and easy to manage. Nettle extract, which is high in vitamin B, is known to help repair hair loss and help clear up dandruff. Thanks to lightweight ingredients, your hair will be shiny and healthy without feeling weighed down by thick oils! We think that this is a wonderful mask to use if you want beautiful hair and need something extra to help treat scalp issues like dandruff, irritation, and hair loss. If you’re a big fan of London Fashion Week, and ever wondered how models keep their hair shiny and gorgeous after several shows of styling, heat, and shows, here’s one of their not-so-dirty little secrets! The professional brand Label.m is the official hair care brand for London Fashion Week, and this mask is one of the ways they keep models’ hair in tiptop shape all week long! This mask uses honey and oats to give hair shine, protection from heat styling, and promotes healthy growth! We like that this mask is lightweight, so you can use it and then style your hair without feeling greasy or weighed down. It’s also great for use on natural hair, color treated hair, or permed hair! All you need to do is add it to clean and damp hair, wait 1-5 minutes, and rinse! 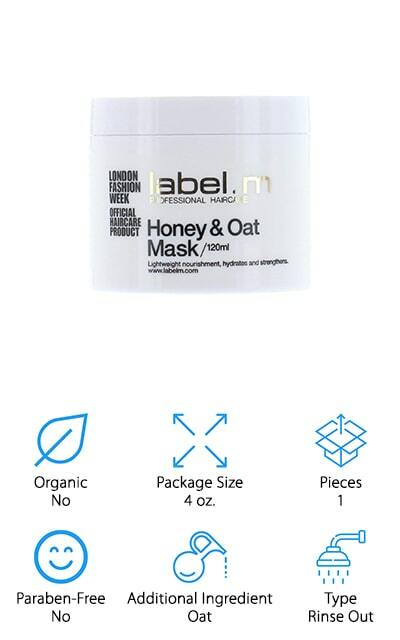 For added benefits, Label.m also makes Honey & Oat shampoo and conditioner you can use daily between weekly mask treatments! Our final review comes to us straight from France – a country known for being the best when it comes to beauty treatments and products! 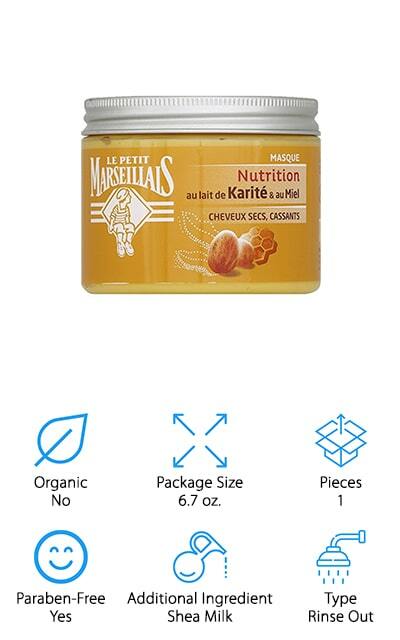 This honey and Shea milk hair mask from Le Petit Marseillais uses natural ingredients to give your hair a healthy shine without weighing it down. It only takes 3 minutes to give your hair a luxurious treatment that will give it shine, prevent breakage, and make tangles glide away for easier styling! If you want to leave it on longer for even stronger moisturizing effects, you totally can! We like that this hair mask is easy to use, and it comes in an adorable tin that will look beautiful on your bathroom counter or in your shower! If you want to keep your hair looking great between mask treatments, Le Petit Marseillais also makes shampoo and conditioner with honey and Shea milk you can use every day as well. Oh, and this product smells amazing, too! When looking for organic honey for hair, this mask is a wonderful way to get a luxurious treatment using ingredients from nature! We like this hair mask because it’s made of familiar ingredients – honey, aloe, olive oil, coconut oil, and more. Everything is derived from plants, seeds, and bees! It’s also free of parabens, silicone, and mineral oil, so you can feel good that you’re putting the best natural products in your hair. This is a great mask for both men and women to use if they have dry, brittle, or chemically treated hair. Just add it to your hair after shampooing, and then leave in for a few minutes before rinsing. You can use it a few times a week, or just add it into your hair care routine when you feel your hair needs a bit of a moisture boost! We think this mask is great for battling breakage, frizz, and static – especially in the cooler winter months!